I've had this race circled on my calendar since Justin Radley told me he was putting it on. The challenge of testing how hard you could push for a finite period of time was very intriguing to me. The week before the Arkansas Traveler 100, Andy Mathews and I met Justin at Ann Dever Park to check out the course. It was dead flat except for a 6 foot climb on the foot bridge over the Peace River at a very gentle 4-5 degree slope. The trail is crushed seashell and packed sand except for about 75 feet of pavement in the parking lot. Other than some larger gravel to navigate in the parking area (more on that later) and one set of small roots at a turn, there was nary a tripping hazard on the course. The park is pretty, and I particularly enjoyed the bridge where you could see mullet in the water, and an osprey who perched on a dead tree nearby all day long. The course would be fast without a doubt. The only challenge was the course was mostly open with limited tree cover. If the day was sunny and hot, we would bake. Race day arrived and everything had aligned for a good race. Justin let us pick bib numbers, and I went with trusty #10. My wife, Sandra, works weekends, and cannot make most of my races. But this race is only 90 minutes from home and occurred on a slow weekend for her; so she took off from work and rode down with Andy and I Saturday morning. With all deference to Andy Mathews, Patrick Bene, and Susan Anger; I had my favorite crew on hand. The weather at the start was nearly ideal, somewhere in the high 50s with a nice breeze. That breeze would pick up to 20+ mph winds in the afternoon; but they were never a problem out on the trail. I enjoyed running into the headwind going out, and picked up speed with the tailwind coming in on every lap. 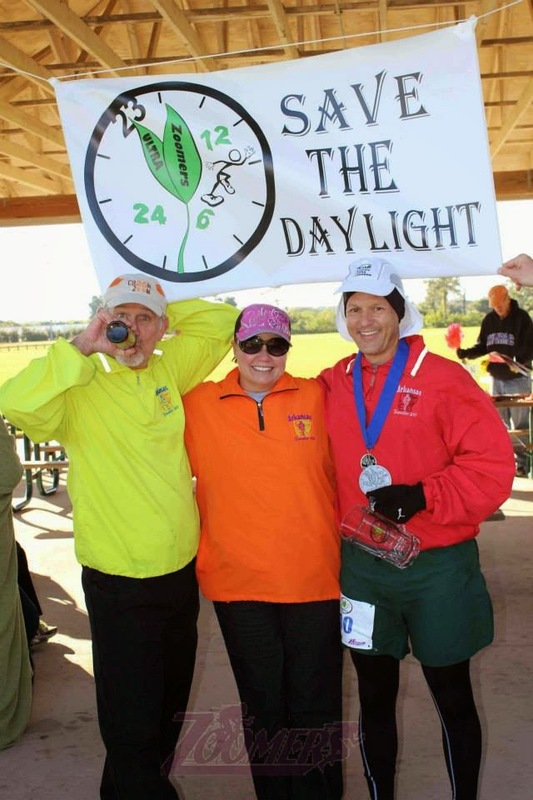 The race started at 9AM, it was unusual for me to start an ultra in broad daylight. Justin included 12 hour options starting at 9AM and 9PM and 6 hour options at 9AM, 3PM, 9PM & 2AM (after the time fall back on daylight savings). So when we started, a number of runners pulled out ahead of me, but I had no idea which time they were running. I started with Kathleen Wheeler as we chit-chatted about various running things for 2+ miles, but then dropped back to run solo. I did not run with anyone else for the next 22 hours. I put my headphones on as I started lap 2 and spent most of the day singing songs in my head, lost in my own thoughts. The course broke down very nicely to track how I was doing and maintaining pace. Justin had marked every 1/2 mile, and I would check my watch for the split each time. With those frequent reminders, I was rarely more than 15 seconds per mile off my goal pace. The issue was, I was almost always 15 seconds fast. Lap after lap, mile after mile. My goal was to do 37 minute laps for as long as I could, and then hold on at the end. But lap after lap, mile after mile, I stayed ahead of the goal. Laps were consistently between 34 and 36 minutes. Several times I gave myself "permission" to back off and have a slower lap, as long as I was still under 40 minutes. I'd get back to the start/finish aid station and find myself sub-37 yet again. I've had a really good year in losing myself in races, not thinking about anything else but the race for 20+ hours, and I was in that zone again here. I calculated and re-calculated my splits and goals over and over again. I noted where other runners were in comparison to me, whether I was gain or losing, and planned what I needed at the turn. I didn't think about work, finances or kids; it was just me and the trail visible ahead of me. It is difficult to describe what a tremendous state of mind this is; but I do know I keep entering ultras to try and go back to this very special place. Sandra was wonderful at the start/finish/aid station. She would race over each time in handing me the things we had planned. I found out later she started working the grill with Andy as the day went on, so would have to sprint over each time she heard me coming in. I only acted exceedingly childish and needy one time in. She handed me grilled cheese sandwiches that were ice cold since I had not taken them the lap prior as planned. When I expressed my displeasure, I realized how churlish I was being when I saw the shocked faces of onlookers around us. I tried harder not to be a jerk the balance of the race. When she took a nap in the middle of the night, Andy and Justin filled in, I never wanted for support. Out on the course, I just kept plugging along. I did not know many of the other runners, but came to know faces and numbers as we passed each other repeatedly on the double ferris-wheel shaped course. The footbridge over the Peace River was the midpoint of the course and I passed people often in this section. I soon came to realize that #47 was coming at me from the other direction in almost the same place every time, That turned out to be Jennifer Carvallo, who would not let me gain an inch on her. In fact, from roughly laps 10-15, she kept gaining on me. I did not know whether she was a half-lap ahead or behind me; but I knew she was running slightly faster than me then. I used that as motivation to keep pressing harder, and finally started to gain back on her as we approached lap 20. My goals for the race were good: 100 miles, better: 110 miles, and best: 120 miles. I knew everything would have to be perfect to hit 120, but felt confident I should be able to get 110. I had a secondary goal of finishing the first 100 miles in under 20 hours, a mark I had come short of in several other attempts. As the afternoon turned into evening and night, I knew I had a chance of going sub-19. So I pressed even harder. Before Ancient Oaks, I thought I would hate the repetitiveness of a small loop course. But the positive reinforcement of seeing runners passing all day and exchanging words of encouragement really fed my effort. It seemed every time I was ready to falter, someone smiled or complimented my pace, and I renewed my resolve each and every time. I came into the start/finish after 30 laps and 99 miles in 18:05. I quickly refueled and charged back onto the course for 1 more fast mile. I passed Jennifer somewhere in here and we both noted we were pushing for a 100 mile time and then backing off. I hit the 100 mile mark in 18:15:33, a new PR by over 2 hours. And from there it was a tale of two races. 5 steps past the 100 mile mark, I took my first walk break of the entire race. Other than pee-breaks and refueling at the start-finish, with no real hills, I had run every step until now. But they came frequently hereafter. I had put so much into my 100 mile time, I had little left emotionally or physically. I had kept the pain in my feet at bay until now, ignoring the stabs each time I landed. Now diminished, they threatened to consume me. I whined each time I came into the start/finish. It was also getting very cold as the temperature dropped into the 40s. I had worn only a tank top until after midnight as I had been sweating hard with the effort level. Even then, I only switched to a short sleeve. 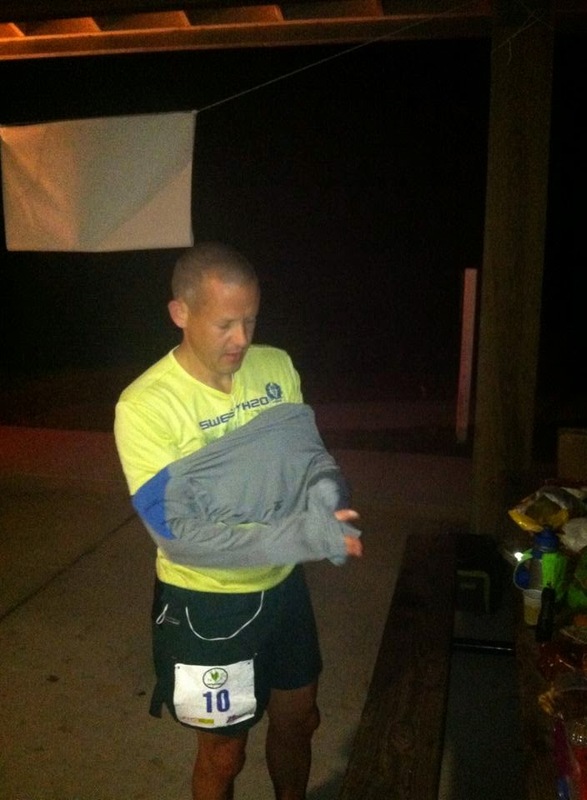 At the 100 mile mark as my paced slowed to a crawl I was soon layered in long sleeves, hat & gloves, and was still cold. Finally, after 34 laps and 112.2 miles, I just couldn't keep myself moving. I checked at the timing table to see I was 2 laps ahead of Jennifer. As I walked to my Jeep, Sandra was asleep in the back and Andy was napping in the driver's seat. I couldn't march past and continue on the course. I hopped in, pulled on running pants and more clothes, and enjoyed the engine heat. Andy and I chatted and I had little motivation to get out. Fortunately, Danielle Zemola came by just after dawn as she was starting her 31st lap and last mile towards 100. She urged us to get out and join her support group which Andy immediately did. 60 seconds later I cursed myself (and them), jumped out and limped/trotted until I caught the small group. The six of us circled one last lap, never breaking out of a walk. We came down the final stretch for what I thought was one last time, and I considered 115.5 miles as a total. I didn't like the number. Plus we had almost 30 minutes left. I convinced Danielle to go back out for one last half-mile so I could get to 116. But then she needed 0.7 to get to an even 103. In the end, we went all the way to the mile mark before turning back to the finish. We caught Jeff Stephens with 100 yards to go, he having just successfully completed his 100 miles, and the 3 of us crossed the finish together with 2 minutes left. The small, cold & somewhat subdued group remaining, celebrated a successful day for everyone, and we left shortly afterwards for much needed sleep. Officially, I finished with 116.5 miles, good for first place. With the 0.8 mile return at the end and another diversion I took, I am marking 117.5 miles in 24 hours in my log book. Either way I am thrilled. I am mildly disappointed I didn't push to 120, but given how bad my feet hurt Monday, am glad I did not do further damage. I have said before, and still maintain, I am not an elite ultrarunner. But I have been very lucky the past 12 months as everything aligned for me to have excellent race performances at just the right time and place. When I won Ancient Oaks in December, I considered it a fluke, and was elated to be able to say I had won at that distance, even if only once. When I won Jeff's inaugural Lake To Ocean in June, I knew it was a special year for me. Now a third win in less than 12 months is almost too good to be true. Combined with going to Western States, 2014 will go down as the apex of my running experience. I likely will not (and should not) win another race again. And that is OK (not that I won't try). Save the Daylight capped off an amazing year for me. 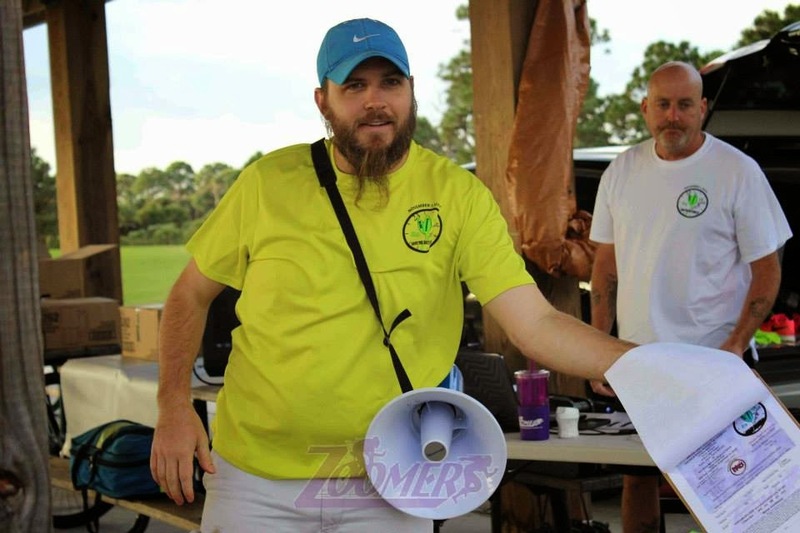 Justin Radley showed he is already becoming an excellent race director with this, and his forthcoming second running of the Caloosahatchee 50K/25K in December. I don't run for swag, but I definitely enjoyed adding the beer mug, unique shaped belt buckle, and race bib to the collection. 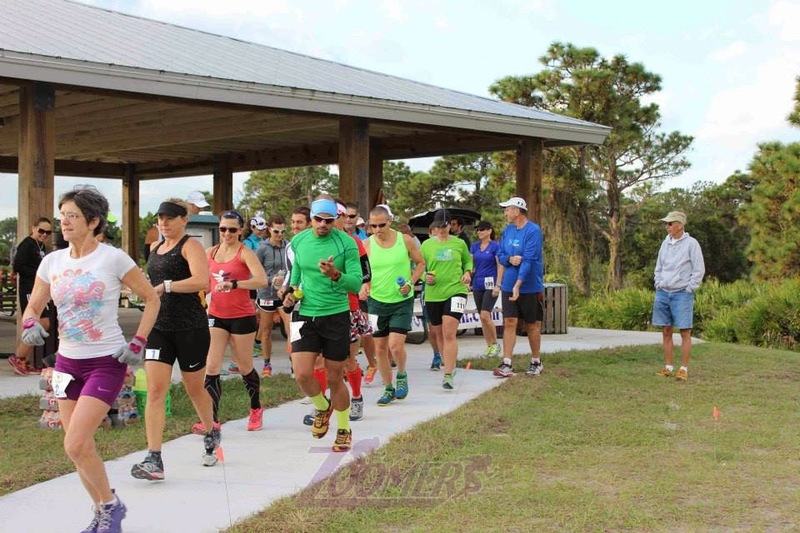 The Southwest Florida running group was great to be around, the support from other runners on the course was as good as I have experienced anywhere. Achieving this one with Sandra there to participate, and hug at the finish, was icing on an already very sweet cake. I can't wait for my feet to heal up, fully recover, and get ready for the next one.